Because there are several Class 43 HST and N.S.W. 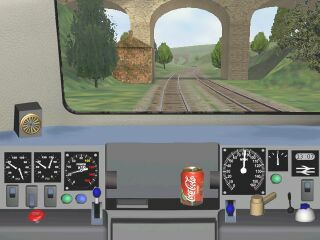 Countrylink models available, to organise the cab and sounds for each it's best to use aliasing. This page describes where to put the files, make a couple of small changes and then how to change the ENGine files to get a prototypical cabview and plenty of HST sound. Class 43 sounds cl43sfx.zip (4.2Mb, 14-Feb-02) from the Train-Sim.com library. Then expand the Trainset sub-folder and check if the Common.Cab and Common.Snd sub-folders are there. If not, highlight the Trainset folder and use Explorer's File/New folder menu to create each one. Then highlight Common.Cab and make a new sub-folder called Intercity125; similarly, create Intercity125 as a sub-folder under Common.Snd (we've used Intercity125 since 2002 is the 25th anniversary of the first Intercity 125 service by a Class 43 HST. With Explorer still open in a maximised window at ...\Common.Cab\Intercity125\, load brcl43.zip in a minimised window. Highlight all the cabview files - you'll know them by the full folder path - and drag them onto some white space in ...\Common.Cab\Intercity125\ in Explorer. Before going on, rename the CVF file, hstcab.cvf, to intercity125cab.cvf so it's easy to remember. The messy job is to now ensure MSTS knows where each graphic file for the cabview is located. Open WordPad and navigate your way through folders until you reach the Intercity125 sub-folder under Common.Cab. Open intercity125cab.cvf. Save the file and exit WordPad. One job down, one to go. In Explorer, under the Common.Snd folder, select the Intercity125 sub-folder. Load cl43sfx.zip. Select all the WAV and SMS files and drag-and-drop them into Intercity125. While here, rename the two SMS files to intercity125eng.sms and intercity125cab.sms to make their names more appropriate. 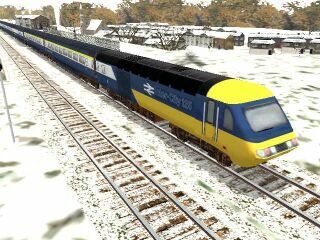 To make life easy, i.e., to save you having to copy the cabview files and the sound files to each HST Class 43 or XPT trainset folder you have installed, we only need to tell MSTS to look in the Common.Cab and Common.Snd folders for the cabview CVF and sound SMS files. Save your ENGine file, exit WordPad and experience the thrill of driving the Class 43 or XPT. Turn up your speaker volume if need be!